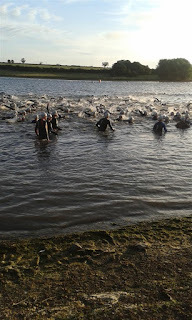 Today is the 13th running of the Vitruvian Triathlon, unlucky for some perhaps. The weather dawns pretty good and race day stays dry throughout. This is usual for me to say the least. Having registered last night and set up my bike in transition at the same time, I probably took it a bit too leisurely on Saturday morning and ended up rushing the few things I had left to do. Not that you can rush much when transition at 5am is a place full of zombified folk who aren’t fully awake yet but will turn into fully honed athletes once they are dipped in reservoir water. I miss part of the race briefing due to my over leisureliness. 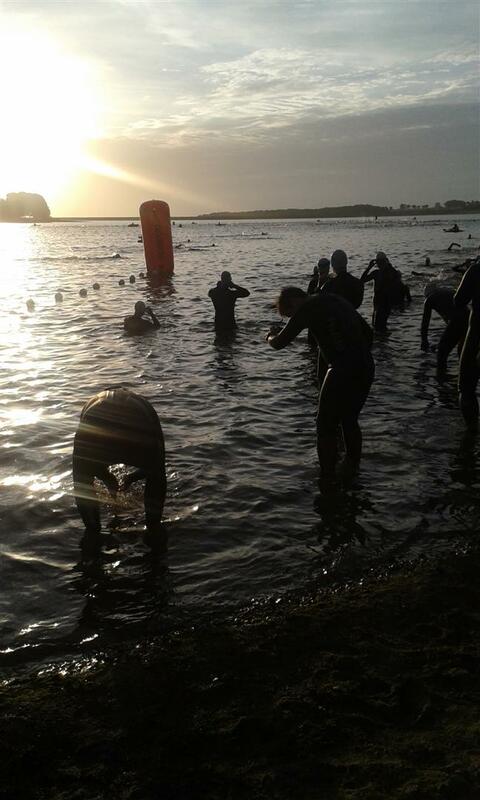 The first swim wave is off at 6:15am, I am off in the 5th and last wave at 6.50am. Clearly they are worried about me if everyone else requires such a big head start. They needn’t have been. The swim is two 950m laps and it's the first time I've done a two lap swim that requires a brief exit from the water and a 25m run back long the 'beach' before getting back in. I get involved in a few scuffles in the first 100m or so which throws all my breathing and heartbeat out, which means I end up resorting to doggie paddle for a while before moving up to first backstroke and then breaststroke. 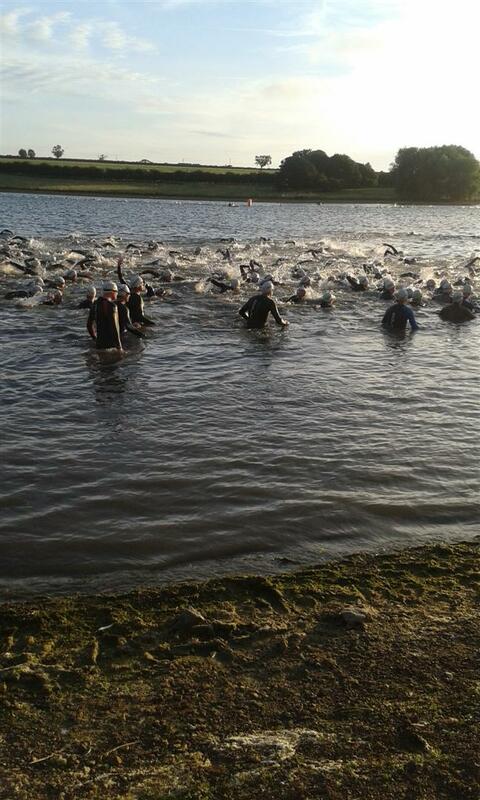 Eventually I attempt to reengage with front crawl but it takes most of the first lap to do so. I also have blinding cramp in my left calf, not good. I am hauled (helpfully) out of the water by the armpits after the first lap and sent staggering on my way before plunging inelegantly back in. 24 minutes for the first lap isn’t great. The second lap is better in that I manage to swim most of it properly but with the field now well thinned out maintaining direction becomes the new problem and on being hauled out of the water by my armpits for a second time I’m appalled to find that my second lap is no quicker than the first. I will put this down to poor direction finding and the fact that I did drag both legs all the way around due to the calf cramp. A total swim time of 50:25 is my worst yet. My transition also needs work, 4:03 is pretty terrible really. I ought to be able to halve that but at least now I’m onto the bit that matters most. The 2-lap bike course. I have done this course twice before in the Dambuster Duathlon and this is the first time it hasn't been excessively windy. Without the wind the terrain doesn’t seem quite so hilly and I also discover to my surprise that the course has some downhills. Previously the in-your-face gale negated these and the nice smooth tarmacked roads are a joy, I hardly see anyone fixing a puncture. At the end of lap one I hurl by Outlaw Half branded water bottle at L before picking up a fresh one. I didn’t want my souvenir bottle to be reused and handed back out to someone else. Lap two goes just as well as lap one and I thoroughly enjoyed minute of the 2:57:06 ride, which is nicely inside the hallowed 3 hours even if it was short. As in 85k rather than the usual 90km for a half iron distance race. So to the 10.5km out-and-back run along the edge of Rutland Water dodging the ‘tourists’ who really didn’t give a monkeys whether they got in anyone’s way or not. In fact, I think most tried to be as disruptive as possible. The whole run is a bit of a limp as the cramp in my calf has not eased one bit on the bike, usually it does. So it’s a case of being careful so that it doesn’t turn into a tear. I had already worked out that a 2:05 half would get me in under six hours. I review and recalibrate this at every km mark. Yes, they have km markers here which is about the only thing they did better than the Outlaw. That’s not a criticism of the organisers, it’s just the Outlaw sets the bar very high. At the end of the first lap I pause for a brief hug with the boys and girl of the support crew before another lap of tourist dodging beckons. I hold my pace and run a 2:02:16 half finishing in 5:55:50. A mere 1:33 behind the winner but I’m happy with that. I’m called a Vitruvian, handed my medal, t-shirt, crisps for the boys, a biscuit for L and a flap jack for me. Then I’m handed a pint of Erdinger, sadly alcohol free. After writhing in agony on the grass for a while, then being reunited with the support crew, I pass my Erdinger to L and head off in search of any available petite blondes who might wish to massage my legs. They are all booked up apparently but a hulking great male offers to do instead. Beggars can’t be choosers of course and he does a brilliant job of reintegrating my calf with the rest of my body. Then I borrow some money off L to pay him before grabbing another Erdinger, sadly still alcohol free. This morning was Derby v Leeds which Sky moved forwards just to annoy me, rather than back as requested. Derby lose 2-1 and still haven’t won yet this season. We have tapas booked tonight at the expensive-but-I’m-worth-it Iberico in the Lace Market. First we have a couple of Tucks in the Borlase and (to save the legs) a first trip on the tram, only eleven years after it opened. I don’t like to rush these things.